Liz Ogbu: Can We Gentrify Neighborhoods While Allowing Longtime Residents To Stay? Liz Ogbu on the TED stage. Part 1 of the TED Radio Hour episode Building Humane Cities. Architect Liz Ogbu has seen the pain gentrification creates for displaced communities. She wonders how we can create ways for longtime residents to stay and reap the benefits of gentrification. Liz Ogbu is an architect who works in underprivileged urban spaces around the world. Her design firm, Studio O, partners with local communities to create a positive social impact through design. For one of her projects, Ogbu worked with a community battling gentrification in Bayview-Hunter's Point, San Francisco. She partnered with StoryCorps to set up a listening booth where community members could have their stories recorded for posterity. Ogbu has taught design courses at California College of the Arts, UC Berkeley, and Stanford University. Ogbu has won many honors for her work, including the 2009 Holcim Global Innovation Prize. She is an Aspen Ideas Scholar and a member of Public Interest Design's Top 100. It's the TED Radio Hour from NPR. I'm Guy Raz. RAZ: Have you lived in cities most of your life? LIZ OGBU: Yes, I'm definitely a city girl. RAZ: Where did you grow up? OGBU: So I grew up here in the Bay Area in Oakland. RAZ: This is architect Liz Ogbu. OGBU: Both my parents are Nigerian immigrants. So I had the experience of growing up in American cities but then also being able to see the cities in Nigeria. RAZ: When you were a kid, what was your impression of these big cities? OGBU: Cities were places where they almost signified opportunity. They were places where you could come and build a career, build a family. Both of my parents came from rural villages. There is this sense that you could do anything in a city. You could make your way and become a certain type of person in the city. RAZ: And when you look at the Bay Area or just, you know, just San Francisco, for example, do you - I mean, do you think that's still true today? OGBU: No. As we have seen things like the tech industry center even more wealth within San Francisco, you're seeing this deep segmentation along class lines. You know, there were always poor communities in San Francisco. So, like, that much hasn't changed. I think it's just become even more extreme. A family of four that earns $114,000 is now classified as low income in San Francisco. That's ridiculous. But that's the reality that we're seeing right now. RAZ: And that reality has reached nearly every corner of San Francisco. And even though gentrification comes with an influx of money for growth and development, it also means a lot of longtime residents who already feel forgotten by the city are being priced out and pushed out of their homes. OGBU: When we talk about doing development in these cities - and it's supposed to just be good that we want to redevelop it. And, you know, economic forces are what economic forces are. So if it so happens that the people who've been there before aren't unable to stay, we have no control over that. It's kind of the way that the talk goes. And, you know, I think that's wrong. 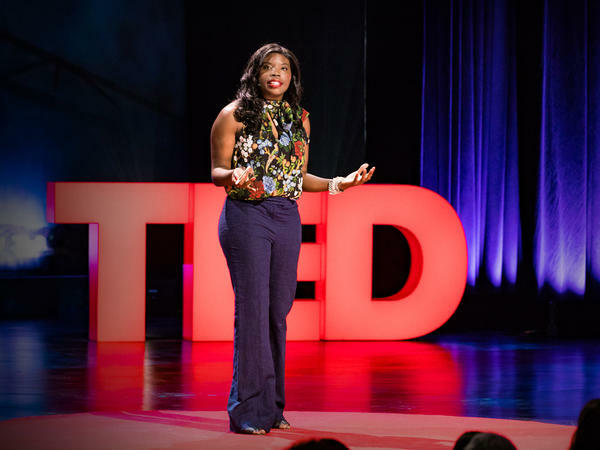 RAZ: Liz Ogbu picks up this idea from the TED stage. OGBU: Developer Majora Carter once said to me poor people don't hate gentrification. They just hate that they rarely get to hang around long enough to enjoy its benefits. Why is it that we treat culture erasure and economic displacement as inevitable? We could approach development with an acknowledgment of past injustices, find value not only in those new stories but the old ones, too, and make a commitment to build people's capacity to stay - to stay in their homes, to stay in their communities, to stay where they feel whole. But to do this rethink, it requires looking at those past injustices and the pain and grief that is interwoven into them. Think about what it would be like to find your favorite local spot, a place where you often went and hung out with the old-timers or your friends, had vanished. And then you get home and you find that there's a letter from your landlord saying that your rent's been doubled. The choice to stay - it's not yours to make. You no longer belong in your home. We often rush to remake these places. But in our boundless desire to do good, to get past all of our mistakes, to build places that hold possibility, we often maintain a blissful ignorance of a landscape filled with a very long trail of broken promises and squelched dreams. We are building on top of brokenness. Is it any wonder that the foundations cannot hold? RAZ: For hundreds of years, cities have been seen as symbols of hope and opportunity and innovation. But cities around the world are also at a crossroads with more and more people flooding into them and many others being pushed out as a result. And so the question is, how will cities confront these challenges? So today on the show, we're going to explore cities, what they represent, if there's such a thing as a humane city and if not, how we can build one. OGBU: I think that we all have a sense of responsibility and accountability in how our cities develop and particularly those of us who come in with any degree of power or privilege. And if we do not leverage that to sort of ask how do we develop this in a way that makes sure that everyone has a chance at opportunity and that those who have been most impacted are centered in our understanding of what we need to do, then we're all just complicit in the erasure of these people and their history from these communities. RAZ: For the past few years, Liz Ogbu has been working on a project in Bayview Hunter's Point. It's a low-income neighborhood in San Francisco. And she's been focused on a 30-acre plot of land there - a plot of land that used to be the site of a power plant. OGBU: Back in the '90s, a community group led by mothers who lived in the public housing on the hill above the plant fought for its closure. They won. The utility company finally tore it down, cleaned the soil and capped most of the site with asphalt so that the clean soil wouldn't blow away. RAZ: Now, the utility company couldn't develop on this site for a while for reasons that had to do with land entitlements, lease agreements, et cetera, et cetera. So Liz was part of a design team that came up with creative ways to use the land. OGBU: And for the last four years, we've been collaborating with those mothers and other residents, as well as local organizations and the utility company. We've been experimenting with all types of events, everything from job-training workshops to an annual circus to even a beautiful, new shoreline trail. A few months ago, there was a community meeting in this neighborhood. The utility company was finally ready to talk long-term redevelopment. That meeting was kind of a disaster. There was a lot of yelling and anger. People asked things like, if you're going to sell it to a developer, wouldn't they just build luxury condos like everyone else? And where's the city been? Why aren't there more jobs and resources in this neighborhood? RAZ: Yeah. I mean, I can understand why people were angry. You know, they were probably thinking, well, wait a minute. We've lived with this power plant for generations. And now you're going to sell the land to a developer who's going to make condos that we can't afford and then push us out of our homes? OGBU: Yeah. I think that they had been seeing that story play out again and again and again throughout the neighborhood. Anytime there was a piece of land that came up, maybe there was a little set aside for affordable housing. But there wasn't nearly as much as people thought there should be. So while they see people coming in and saying, oh, OK, Bayview's no longer the ghetto - we can redevelop it - that it wasn't necessarily redeveloped with them in mind - and so their greatest fear here was that the story was about to play out again. And it stung even more because it was this site that they had fought for. OGBU: Holding space for pain and grief was never part of my job description as an architect. But I've seen what happens when there's space for pain. It can be transformational. When we first started working in the neighborhood, one of the first things we did was go out and interview the activists who had led the fight to close the plant. We consistently heard and felt from them a sense of impending loss. UNIDENTIFIED PERSON #1: When I was a 9-year-old little girl running around in the Bayview, it was a little different because it was more families. UNIDENTIFIED PERSON #2: Back then, as a child, it was perfection. OGBU: People were leaving or dying of old age. And with those departures, stories were being lost. UNIDENTIFIED PERSON #3: A lot of people had open-door policy. You could just go from one building to the next. OGBU: No one was going to know the amazing things that had happened in this community because to everyone on the outside, it was the ghetto - at worse, a place of violence, at best, a blank slate. Neither was true, of course. So my colleagues and I - we reached out to a StoryCorps. And we built a listening booth on our site. UNIDENTIFIED PERSON #4: At the end of the block was a sewer system. And, of course, we had the smells every morning and all of that. OGBU: And we invited the residents to come and have their stories recorded for posterity. UNIDENTIFIED PERSON #4: But what was special about that area is that there was this patch of green grass, and we had no parks around, so either we played on the block in the street or we found this little patch. OGBU: After a few days of recording, we held a listening party. UNIDENTIFIED PERSON #1: My dad worked three or four jobs. He was a fisherman. He raised chickens. He had a garden. Every Saturday, I could just remember people coming to my house with bags and getting strawberries. And I didn't feel like I was poor or living in poverty just because I grew up in Bayview. OGBU: It was one of the most amazing community meetings I've ever been a part of, in part because we didn't just talk about joy but also pain. UNIDENTIFIED PERSON #2: When the crack epidemic hit, it went crazy. Places like Bayview became more crime-ridden and infested. UNIDENTIFIED PERSON #4: And right now, we're just losing so many families. OGBU: We cannot create cities for everyone unless we're first willing to listen to everyone. RAZ: And we should say that, you know, the debate over how this site will be developed is - I think, it's still ongoing, right? RAZ: ...And people who have lived in neighborhoods in those cities that were relatively affordable can't do it anymore? What happens if nothing changes? OGBU: Gosh. That's a hard question. I mean, what we're seeing happening right now - it's unsustainable. And when I say unsustainable, I don't mean that it couldn't continue to happen. But I think the things that we ascribe to being beneficial for living in a society or in community, the aspirations we have and what that looks like - eventually, all of this pushes it to a point where that breaks. RAZ: I mean, part of the system that's driving this is, you know, developers who buy the land and then build the condos and then expect a certain return, like, from every unit, every condo sold, right? RAZ: But could you test out something that works in a different way? RAZ: I mean, like, could American cities take, you know, big chunks of land and do something very different with that land? OGBU: It's a huge bit of risk. And it would require you setting up other metrics of success, right? OGBU: Yes. I think it's completely reframing how we think about this. Like, we shouldn't be talking about housing. We should be talking about homes. OGBU: Because when we talk about housing, we judge our success in the number of units created. And shouldn't we be judging it in terms of number of better lives lived? It's harder to figure out how to measure that. But I don't know if this grand project that we call the city ultimately can work if we don't start to measure our success in those terms. RAZ: That's architect Liz Ogbu. You can check out her entire talk at ted.com. On the show today - building humane cities. I'm Guy Raz, and you're listening to the TED Radio Hour from NPR. Transcript provided by NPR, Copyright NPR.